The difference between solar PV and solar thermal energy is an important topic and one that many people often overlook. This article will help you distinguish between the two by taking a closer look at each one. Solar PV is short for solar photovoltaics. This technology involves the process we use to convert solar radiation into electricity. It is this process that is fundamentally different from solar thermal energy which instead uses the sun to heat fluids or air – more on that later. Solar PV cells are used to generate electricity from the sun. How many solar panels are in use. The output capacity and performance of each solar panel. The availability and intensity of solar radiation in the current environment. Whether you have maintained your solar cells correctly. 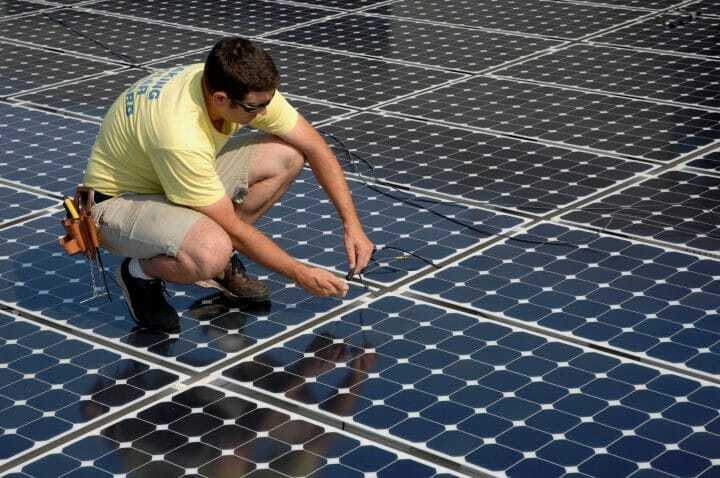 Solar farms also make use of photovoltaics by simply linking multiple solar cells together. This allows a solar farm to generate significant quantities of electricity, depending on its capacity. One of the biggest problems with solar PV is capacity. You often require a number of solar panels to meet the energy demands of a small household. As a result, the upfront cost of a home solar PV system can be quite expensive. Another key issue is how to store solar power for later use. Solar panels can’t generate electricity in the dark. Therefore, you should use batteries to store some of the electricity that your solar panels generate during the day. You can then draw power from these batteries at night when the sun has gone down. The drawback of this process is that batteries are expensive and often take up lots of space. To combat the above, many homeowners opt for a lower capacity system that offers a daytime boost to their electricity supply. This helps to reduce energy bills from your utility company. Some homeowners even decide to sell back any excess solar power they generate in a process known as ‘net metering’. This helps to improve the return on investment (ROI) of a solar energy installation. It can also accelerate the time it takes a system to pay for itself. Couple this with a solar energy grant or federal tax credit and the ROI can be even greater. Next, we’ll take a look at how solar thermal energy differs from solar photovoltaics. Solar thermal is different from solar PV in that it does not generate electricity. Instead, we use solar thermal energy to heat either a liquid or air. 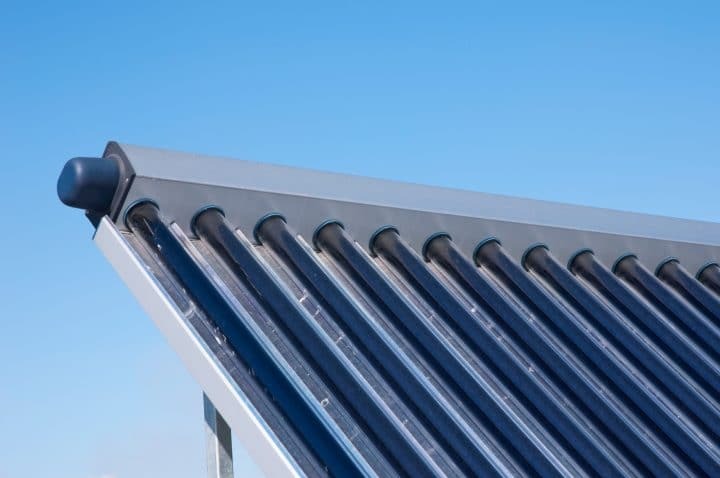 Liquids can be used in a solar hot water system whilst air can be used in a more traditional manner – for example, when heating a greenhouse. Solar thermal collectors like these are used to heat liquids. It is important to understand that whilst solar thermal can’t generate electricity directly, it can still be used for this purpose. Solar thermal power plants do exist and make use of this technology by concentrating it to a point where the liquid becomes superheated and turns to steam. This steam can then be used to turn a turbine which will then use a generator to produce electricity. Let’s now switch the focus back to residential solar thermal systems. Here, there are two different ways in which we can use solar thermal energy. We commonly refer to these as either active or passive. Active solar thermal makes use of specific technologies to help improve its effectiveness. Most residential solar hot water systems use active technologies. Such systems use a solar collector to heat a fluid which is then fed into a heat exchanger to help heat a separate water supply. You can then use this heated water for showers, baths, radiators, and hot water taps. Many of the drawbacks of solar PV also apply to an active solar thermal system. Firstly, a solar hot water system can be expensive to install. Secondly, it will require an adequate level of solar radiation to be effective, even more so than solar PV. Passive solar thermal often involves adapting the design of a building to make it more energy efficient. This helps a building absorb solar radiation and transfer it to areas that need it the most. Passive solar energy is beyond the scope of this article – the primary focus of which is on active solar energy systems. Now you understand the key differences between solar PV and solar thermal, you will have a better idea of which system is most suitable for your needs. Solar PV is a more flexible solution that solar thermal, allowing you to generate electricity which you can then use across your home. Depending on the capacity of your system, you might even use solar electricity to power an electric shower unit – thus providing a source of solar hot water. Active solar thermal technologies may be a viable option depending on where you live and the budget you have available for your project. Under the right conditions, solar thermal can be the ideal solution to help meet the hot water demands of a busy household.